Memory is the ability to take in information, store it, and recall it at a later time. In psychology, memory is broken into three stages: encoding, storage, and retrieval. 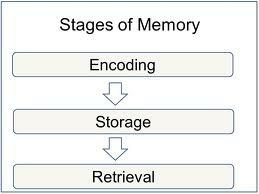 Stages of memory: The three stages of memory: encoding, storage, and retrieval. Problems can occur at any stage of the process. Encoding (or registration): the process of receiving, processing, and combining information. Encoding allows information from the outside world to reach our senses in the forms of chemical and physical stimuli. In this first stage we must change the information so that we may put the memory into the encoding process. Storage: the creation of a permanent record of the encoded information. Storage is the second memory stage or process in which we maintain information over periods of time. Retrieval (or recall, or recognition): the calling back of stored information in response to some cue for use in a process or activity. The third process is the retrieval of information that we have stored. We must locate it and return it to our consciousness. Some retrieval attempts may be effortless due to the type of information. Problems can occur at any stage of the process, leading to anything from forgetfulness to amnesia. Distraction can prevent us from encoding information initially; information might not be stored properly, or might not move from short-term to long-term storage; and/or we might not be able to retrieve the information once it’s stored. Sensory memory allows individuals to retain impressions of sensory information after the original stimulus has ceased. One of the most common examples of sensory memory is fast-moving lights in darkness: if you’ve ever lit a sparkler on the Fourth of July or watched traffic rush by at night, the light appears to leave a trail. This is because of “iconic memory,” the visual sensory store. Two other types of sensory memory have been extensively studied: echoic memory (the auditory sensory store) and haptic memory (the tactile sensory store). Sensory memory is not involved in higher cognitive functions like short- and long-term memory; it is not consciously controlled. The role of sensory memory is to provide a detailed representation of our entire sensory experience for which relevant pieces of information are extracted by short-term memory and processed by working memory. Short-term memory is also known as working memory. It holds only a few items (research shows a range of 7 +/- 2 items) and only lasts for about 20 seconds. However, items can be moved from short-term memory to long-term memory via processes like rehearsal. An example of rehearsal is when someone gives you a phone number verbally and you say it to yourself repeatedly until you can write it down. If someone interrupts your rehearsal by asking a question, you can easily forget the number, since it is only being held in your short-term memory. Long-term memories are all the memories we hold for periods of time longer than a few seconds; long-term memory encompasses everything from what we learned in first grade to our old addresses to what we wore to work yesterday. Long-term memory has an incredibly vast storage capacity, and some memories can last from the time they are created until we die. There are many types of long-term memory. 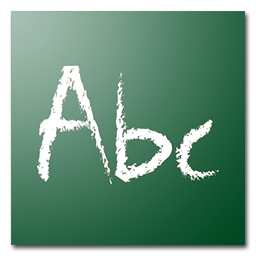 Explicit or declarative memory requires conscious recall; it consists of information that is consciously stored or retrieved. Explicit memory can be further subdivided into semantic memory (facts taken out of context, such as “Paris is the capital of France”) and episodic memory (personal experiences, such as “When I was in Paris, I saw the Mona Lisa“). In contrast to explicit/declarative memory, there is also a system for procedural/implicit memory. These memories are not based on consciously storing and retrieving information, but on implicit learning. Often this type of memory is employed in learning new motor skills. An example of implicit learning is learning to ride a bike: you do not need to consciously remember how to ride a bike, you simply do. This is because of implicit memory. Memory storage allows us to hold onto information for a very long duration of time—even a lifetime. Memories are not stored as exact replicas of experiences; instead, they are modified and reconstructed during retrieval and recall. Memory storage is achieved through the process of encoding, through either short- or long-term memory. During the process of memory encoding, information is filtered and modified for storage in short-term memory. Information in short-term memory deteriorates constantly; however, if the information is deemed important or useful, it is transferred to long-term memory for extended storage. Because long-term memories must be held for indefinite periods of time, they are stored, or consolidated, in a way that optimizes space for other memories. As a result, long-term memory can hold much more information than short-term memory, but it may not be immediately accessible. The way long-term memories are stored is similar to a digital compression. This means that information is filed in a way that takes up the least amount of space, but in the process, details of the memory may be lost and not easily recovered. Because of this consolidation process, memories are more accurate the sooner they are retrieved after being stored. As the retention interval between encoding and retrieval of the memory lengthens, the accuracy of the memory decreases. Short-term memory is the ability to hold information for a short duration of time (on the order of seconds). In the process of encoding, information enters the brain and can be quickly forgotten if it is not stored further in the short-term memory. George A. Miller suggested that the capacity of short-term memory storage is approximately seven items plus or minus two, but modern researchers are showing that this can vary depending on variables like the stored items’ phonological properties. When several elements (such as digits, words, or pictures) are held in short-term memory simultaneously, their representations compete with each other for recall, or degrade each other. Thereby, new content gradually pushes out older content, unless the older content is actively protected against interference by rehearsal or by directing attention to it. Information in the short-term memory is readily accessible, but for only a short time. It continuously decays, so in the absence of rehearsal (keeping information in short-term memory by mentally repeating it) it can be forgotten. In contrast to short-term memory, long-term memory is the ability to hold semantic information for a prolonged period of time. Items stored in short-term memory move to long-term memory through rehearsal, processing, and use. The capacity of long-term memory storage is much greater than that of short-term memory, and perhaps unlimited. However, the duration of long-term memories is not permanent; unless a memory is occasionally recalled, it may fail to be recalled on later occasions. This is known as forgetting. Long-term memory storage can be affected by traumatic brain injury or lesions. Amnesia, a deficit in memory, can be caused by brain damage. Anterograde amnesia is the inability to store new memories; retrograde amnesia is the inability to retrieve old memories. These types of amnesia indicate that memory does have a storage process. A variety of different memory models have been proposed to account for different types of recall. 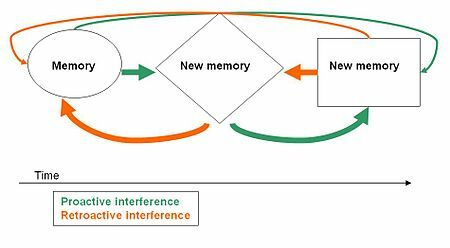 In order to explain the recall process, however, a memory model must identify how an encoded memory can reside in memory storage for a prolonged period of time until the memory is accessed again, during the recall process. Note that all models use the terminology of short-term and long-term memory to explain memory storage. The multi-trace distributed memory model suggests that the memories being encoded are converted to vectors (lists of values), with each value or “feature” in the vector representing a different attribute of the item to be encoded. These vectors are called memory traces. A single memory is distributed to multiple attributes, so that each attribute represents one aspect of the memory being encoded. These vectors are then added into the memory array or matrix (a list of vectors). In order to retrieve the memory for the recall process, one must cue the memory matrix with a specific probe. The memory matrix is constantly growing, with new traces being added in. The multi-trace model has two key limitations: the notion of an ever-growing matrix within human memory sounds implausible, and the idea of computational searches for specific memories among millions of traces that would be present within the memory matrix sounds far beyond the scope of the human-recalling process. The neural network model is the ideal model in this case, as it overcomes the limitations posed by the multi-trace model and maintains the useful features of the model as well. The neural network model assumes that neurons form a complex network with other neurons, forming a highly interconnected network; each neuron is characterized by the activation value (how much energy it takes to activate that neuron), and the connection between two neurons is characterized by the weight value (how strong the connection between those neurons is). In this model, connections are formed in the process of memory storage, strengthened through use, and weakened through disuse. The dual-store memory search model, now referred to as the search-of-associative-memory (SAM) model, remains one of the most influential computational models of memory. Two types of memory storage, short-term store and long-term store, are utilized in the SAM model. In the recall process, items residing in the short-term memory store will be recalled first, followed by items residing in the long-term store, where the probability of being recalled is proportional to the strength of the association present within the long-term store. Another type of memory storage, the semantic matrix, is used to explain the semantic effect associated with memory recall. According to network models of memory, the connections between neurons are the source of memories, and the strength of connections corresponds to how well a memory is stored. Network models of memory storage emphasize the role of connections between stored memories in the brain. The basis of these theories is that neural networks connect and interact to store memories by modifying the strength of the connections between neural units. In network theory, each connection is characterized by a weight value that indicates the strength of that particular connection. The stronger the connection, the easier a memory is to retrieve. Network models are based on the concept of connectionism. Connectionism is an approach in cognitive science that models mental or behavioral phenomena as the emergent processes of interconnected networks that consist of simple units. 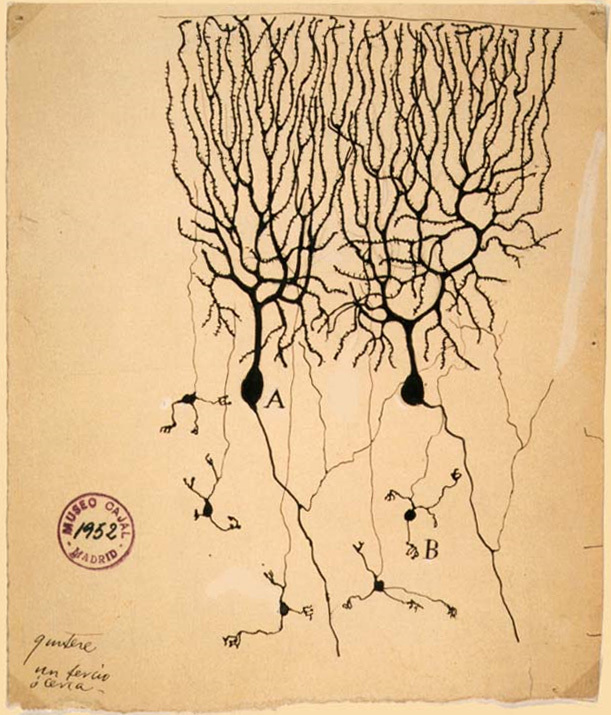 Connectionism was introduced in the 1940s by Donald Hebb, who said the famous phrase, “Cells that fire together wire together.” This is the key to understanding network models: neural units that are activated together strengthen the connections between themselves. There are several types of network models in memory research. Some define the fundamental network unit as a piece of information. Others define the unit as a neuron. However, network models generally agree that memory is stored in neural networks and is strengthened or weakened based on the connections between neurons. Network models are not the only models of memory storage, but they do have a great deal of power when it comes to explaining how learning and memory work in the brain, so they are extremely important to understand. Neural connections: As neurons form connections with each other through their many dendrites, they can form complex networks. Network models propose that these connections are the basis of storing and retrieving memories. The parallel distributed processing (PDP) model is an example of a network model of memory, and it is the prevailing connectionist approach today. PDP posits that memory is made up of neural networks that interact to store information. 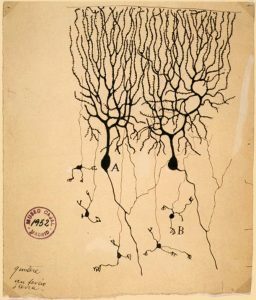 It is more of a metaphor than an actual biological theory, but it is very useful for understanding how neurons fire and wire with each other. Taking its metaphors from the field of computer science, this model stresses the parallel nature of neural processing. “Parallel processing” is a computing term; unlike serial processing (performing one operation at a time), parallel processing allows hundreds of operations to be completed at once—in parallel. Under PDP, neural networks are thought to work in parallel to change neural connections to store memories. This theory also states that memory is stored by modifying the strength of connections between neural units. Neurons that fire together frequently (which occurs when a particular behavior or mental process is engaged many times) have stronger connections between them. If these neurons stop interacting, the memory’s strength weakens. This model emphasizes learning and other cognitive phenomena in the creation and storage of memory. The hippocampus, amygdala, and cerebellum play important roles in the consolidation and manipulation of memory. Memory consolidation is a category of processes that stabilize a memory trace after its initial acquisition. Like encoding, consolidation affects how well a memory will be remembered after it is stored: if it is encoded and consolidated well, the memory will be easily retrieved in full detail, but if encoding or consolidation is neglected, the memory will not be retrieved or may not be accurate. Consolidation occurs through communication between several parts of the brain, including the hippocampus, the amygdala, and the cerebellum. The hippocampus: The hippocampus is integral in consolidating memories from short-term to long-term memory. While psychologists and neuroscientists debate the exact role of the hippocampus, they generally agree that it plays an essential role in both the formation of new memories about experienced events and declarative memory (which handles facts and knowledge rather than motor skills). The hippocampus is critical to the formation of memories of events and facts. Information regarding an event is not instantaneously stored in long-term memory. Instead, sensory details from the event are slowly assimilated into long-term storage over time through the process of consolidation. Some evidence supports the idea that, although these forms of memory often last a lifetime, the hippocampus ceases to play a crucial role in the retention of memory after the period of consolidation. Damage to the hippocampus usually results in difficulties forming new memories, or anterograde amnesia, and normally also brings about problems accessing memories that were created prior to the damage, or retrograde amnesia. A famous case study that made this theory plausible is the story of a patient known as HM: After his hippocampus was removed in an effort to cure his epilepsy, he lost the ability to form memories. People with damage to the hippocampus may still be able to learn new skills, however, because those types of memory are non-declarative. Damage may not affect much older memories. All this contributes to the idea that the hippocampus may not be crucial in memory retention in the post-consolidation stages. 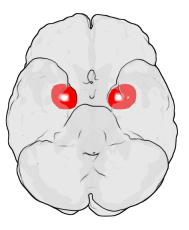 The amygdala: The amygdala is involved in enhancing the consolidation of emotional memories. The amygdala is involved in memory consolidation—specifically, in how consolidation is modulated. “Modulation” refers to the strength with which a memory is consolidated. In particular, it appears that emotional arousal following an event influences the strength of the subsequent memory. Greater emotional arousal following learning enhances a person’s retention of that stimulus. The amygdala is involved in mediating the effects of emotional arousal on the strength of the memory of an event. Even if the amygdala is damaged, memories can still be encoded. The amygdala is most helpful in enhancing the memories of emotionally charged events, such as recalling all of the details on a day when you experienced a traumatic accident. 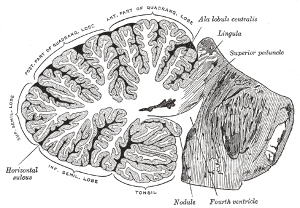 The cerebellum: A vertical cross-section of the human cerebellum, showing the folding pattern of the cortex, and interior structures. 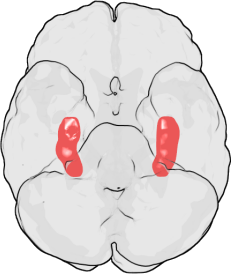 The cerebellum plays a role in the learning of procedural memory (i.e., routine, “practiced” skills), and motor learning, such as skills requiring coordination and fine motor control. Playing a musical instrument, driving a car, and riding a bike are examples of skills requiring procedural memory. The cerebellum is more generally involved in motor learning, and damage to it can result in problems with movement; specifically, it is thought to coordinate the timing and accuracy of movements, and to make long-term changes (learning) to improve these skills. A person with hippocampal damage might still be able to remember how to play the piano but not remember facts about their life. But a person with damage to their cerebellum would have the opposite problem: they would remember their declarative memories, but would have trouble with procedural memories like playing the piano. Although the physical location of memory remains relatively unknown, it is thought to be distributed in neural networks throughout the brain. Many areas of the brain have been associated with the processes of memory storage. Lesion studies and case studies of individuals with brain injuries have allowed scientists to determine which areas of the brain are most associated with which kinds of memory. However, the actual physical location of memories remains relatively unknown. It is theorized that memories are stored in neural networks in various parts of the brain associated with different types of memory, including short-term memory, sensory memory, and long-term memory. Keep in mind, however, that it is not sufficient to describe memory as solely dependent on specific brain regions, although there are areas and pathways that have been shown to be related to certain functions. Memory traces, or engrams, are the physical neural changes associated with memory storage. The big question of how information and mental experiences are coded and represented in the brain remains unanswered. However, scientists have gained much knowledge about neuronal codes from studies on neuroplasticity, the brain’s capacity to change its neural connections. Most of this research has been focused on simple learning and does not clearly describe changes involved in more complex examples of memory. Encoding of working memory involves the activation of individual neurons induced by sensory input. These electric spikes continue even after the sensation stops. Encoding of episodic memory (i.e., memories of experiences) involves lasting changes in molecular structures that alter communication between neurons. Recent functional-magnetic-resonance-imaging (fMRI) studies detected working memory signals in the medial temporal lobe and the prefrontal cortex. These areas are also associated with long-term memory, suggesting a strong relationship between working memory and long-term memory. Lobes of the cerebral cortex: While memory is created and stored throughout the brain, some regions have been shown to be associated with specific types of memory. 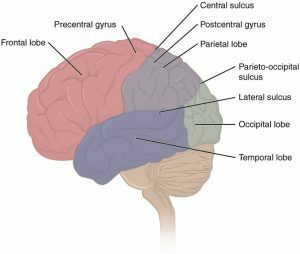 The temporal lobe is important for sensory memory, while the frontal lobe is associated with both short- and long-term memory. Imaging research and lesion studies have led scientists to conclude that certain areas of the brain may be more specialized for collecting, processing, and encoding specific types of memories. Activity in different lobes of the cerebral cortex have been linked to the formation of memories. The temporal and occipital lobes are associated with sensation and are thus involved in sensory memory. Sensory memory is the briefest form of memory, with no storage capability. Instead, it is a temporary “holding cell” for sensory information, capable of holding information for seconds at most before either passing it to short-term memory or letting it disappear. Short-term memory is supported by brief patterns of neural communication that are dependent on regions of the prefrontal cortex, frontal lobe, and parietal lobe. The hippocampus is essential for the consolidation of information from short-term to long-term memory; however, it does not seem to store information itself, adding mystery to the question of where memories are stored. The hippocampus receives input from different parts of the cortex and sends output to various areas of the brain. The hippocampus may be involved in changing neural connections for at least three months after information is initially processed. This area is believed to be important for spatial and declarative (i.e., fact-based) memory as well. Long-term memory is maintained by stable and permanent changes in neural connections spread throughout the brain. The processes of consolidating and storing long-term memories have been particularly associated with the prefrontal cortex, cerebrum, frontal lobe, and medial temporal lobe. However, the permanent storage of long-term memories after consolidation and encoding appears to depend upon the connections between neurons, with more deeply processed memories having stronger connections. Memories can be encoded poorly or fade with time; the storage and recovery process is not flawless. Memory is not perfect. Storing a memory and retrieving it later involves both biological and psychological processes, and the relationship between the two is not fully understood. Memories are affected by how a person internalizes events through perceptions, interpretations, and emotions. This can cause a divergence between what is internalized as a memory and what actually happened in reality; it can also cause events to encode incorrectly, or not at all. The Thinker by Auguste Rodin: Our memories are not infallible: over time, without use, memories decay and we lose the ability to retrieve them. It is easier to remember recent events than those further in the past, and the more we repeat or use information, the more likely it is to enter into long-term memory. However, without use, or with the addition of new memories, old memories can decay. “Transience” refers to the general deterioration of a specific memory over time. Transience is caused by proactive and retroactive interference. Proactive interference is when old information inhibits the ability to remember new information, such as when outdated scientific facts interfere with the ability to remember updated facts. Retroactive interference is when new information inhibits the ability to remember old information, such as when hearing recent news figures, then trying to remember earlier facts and figures. Encoding is the process of converting sensory input into a form able to be processed and stored in the memory. However, this process can be impacted by a number of factors, and how well information is encoded affects how well it is able to be recalled later. Memory is associative by nature; commonalities between points of information not only reinforce old memories, but serve to ease the establishment of new ones. The way memories are encoded is personal; it depends on what information an individual considers to be relevant and useful, and how it relates to the individual’s vision of reality. All of these factors impact how memories are prioritized and how accessible they will be when they are stored in long-term memory. Information that is considered less relevant or less useful will be harder to recall than memories that are deemed valuable and important. Memories that are encoded poorly or shallowly may not be recoverable at all. There are many ways in which a memory might fail to be retrieved, or be forgotten. Memory is not static. How you remember an event depends on a large number of variables, including everything from how much sleep you got the night before to how happy you were during the event. Memory is not always perfectly reliable, because it is influenced not only by the actual events it records, but also by other knowledge, experiences, expectations, interpretations, perceptions, and emotions. And memories are not necessarily permanent: they can disappear over time. This process is called forgetting. But why do we forget? The answer is currently unknown. There are several theories that address why we forget memories and information over time, including trace decay theory, interference theory, and cue-dependent forgetting. Memory over time: Over time, a memory becomes harder to remember. A memory is most easily recalled when it is brand new, and without rehearsal, begins to be forgotten. The trace decay theory of forgetting states that all memories fade automatically as a function of time. Under this theory, you need to follow a certain pathway, or trace, to recall a memory. If this pathway goes unused for some amount of time, the memory decays, which leads to difficulty recalling, or the inability to recall, the memory. Rehearsal, or mentally going over a memory, can slow this process. But disuse of a trace will lead to memory decay, which will ultimately cause retrieval failure. This process begins almost immediately if the information is not used: for example, sometimes we forget a person’s name even though we have just met them. Memory interference: Both old and new memories can impact how well we are able to recall a memory. This is known as proactive and retroactive interference. It is easier to remember recent events than those further in the past. ” Transience ” refers to the general deterioration of a specific memory over time. 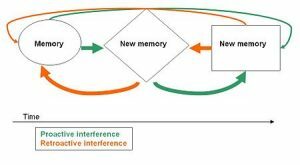 Under interference theory, transience occurs because all memories interfere with the ability to recall other memories. Proactive and retroactive interference can impact how well we are able to recall a memory, and sometimes cause us to forget things permanently. Proactive interference occurs when old memories hinder the ability to make new memories. In this type of interference, old information inhibits the ability to remember new information, such as when outdated scientific facts interfere with the ability to remember updated facts. This often occurs when memories are learned in similar contexts, or regarding similar things. It’s when we have preconceived notions about situations and events, and apply them to current situations and events. An example would be growing up being taught that Pluto is a planet in our solar system, then being told as an adult that Pluto is no longer considered a planet. Having such a strong memory would negatively impact the recall of the new information, and when asked how many planets there are, someone who grew up thinking of Pluto as a planet might say nine instead of eight. Retroactive interference occurs when old memories are changed by new ones, sometimes so much that the original memory is forgotten. This is when newly learned information interferes with and impedes the recall of previously learned information. The ability to recall previously learned information is greatly reduced if that information is not utilized, and there is substantial new information being presented. This often occurs when hearing recent news figures, then trying to remember earlier facts and figures. An example of this would be learning a new way to make a paper airplane, and then being unable to remember the way you used to make them. When we store a memory, we not only record all sensory data, we also store our mood and emotional state. Our current mood thus will affect the memories that are most effortlessly available to us, such that when we are in a good mood, we recollect good memories, and when we are in a bad mood, we recollect bad ones. This suggests that we are sometimes cued to remember certain things by, for example, our emotional state or our environment. Semantic cues are used when a memory is retrieved because of its association with another memory. For example, someone forgets everything about his trip to Ohio until he is reminded that he visited a certain friend there, and that cue causes him to recollect many more events of the trip. State-dependent cues are governed by the state of mind at the time of encoding. The emotional or mental state of the person (such as being inebriated, drugged, upset, anxious, or happy) is key to establishing cues. Under cue-dependent forgetting theory, a memory might be forgotten until a person is in the same state. Context-dependent cues depend on the environment and situation. Memory retrieval can be facilitated or triggered by replication of the context in which the memory was encoded. Such conditions can include weather, company, location, the smell of a particular odor, hearing a certain song, or even tasting a specific flavor. Trace decay, interference, and lack of cues are not the only ways that memories can fail to be retrieved. Memory’s complex interactions with sensation, perception, and attention sometimes render certain memories irretrievable. If you’ve ever put down your keys when you entered your house and then couldn’t find them later, you have experienced absentmindedness. Attention and memory are closely related, and absentmindedness involves problems at the point where attention and memory interface. Common errors of this type include misplacing objects or forgetting appointments. Absentmindedness occurs because at the time of encoding, sufficient attention was not paid to what would later need to be recalled. Occasionally, a person will experience a specific type of retrieval failure called blocking. Blocking is when the brain tries to retrieve or encode information, but another memory interferes with it. 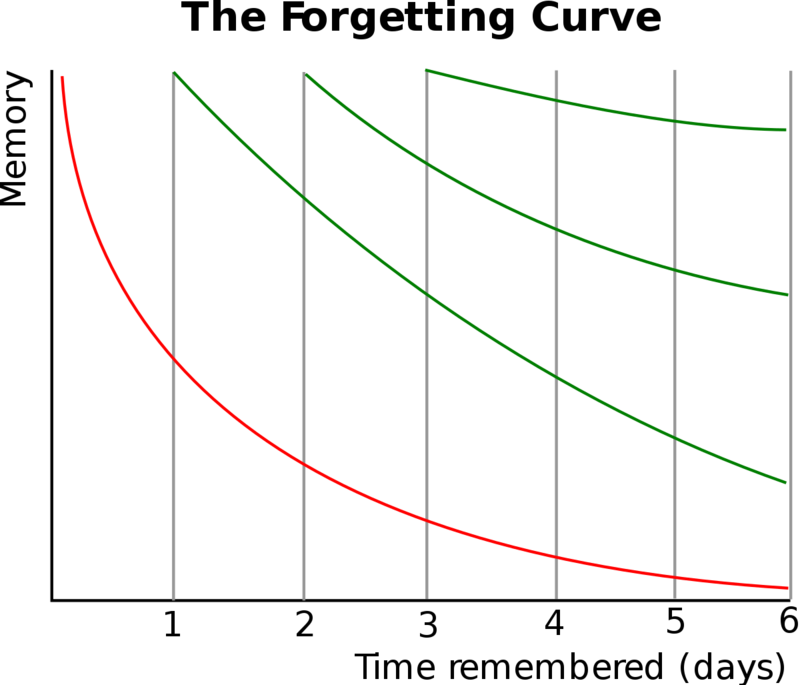 Blocking is a primary cause of the tip-of-the-tongue phenomenon. This is the failure to retrieve a word from memory, combined with partial recall and the feeling that retrieval is imminent. People who experience this can often recall one or more features of the target word, such as the first letter, words that sound similar, or words that have a similar meaning. Sometimes a hint can help them remember: another example of cued memory. “Amnesia” is a general term for the inability to recall certain memories, or in some cases, the inability t0 form new memories. Some types of amnesia are due to neurological trauma; but in other cases, the term “amnesia” is just used to describe normal memory loss, such as not remembering childhood memories. Amnesia: There are two main forms of amnesia: retrograde and anterograde. Retrograde prevents recall of information encoded before a brain injury, and anterograde prevents recall of information encountered after a brain injury. Amnesia typically occurs when there is damage to a variety of regions of the temporal lobe or the hippocampus, causing the inability to recall memories before, or after, an (often traumatic) event. There are two main forms of amnesia: retrograde and anterograde. Retrograde amnesia is the inability to recall memories made before the onset of amnesia. Retrograde amnesia is usually caused by head trauma or brain damage to parts of the brain other than the hippocampus (which is involved with the encoding process of new memories). Brain damage causing retrograde amnesia can be as varied as a cerebrovascular accident, stroke, tumor, hypoxia, encephalitis, or chronic alcoholism. Retrograde amnesia is usually temporary, and can often be treated by exposing the sufferer to cues for memories of the period of time that has been forgotten. The man with no short-term memory: In 1985, Clive Wearing, then a well-known musicologist, contracted a herpes simplex virus that attacked his central nervous system. The virus damaged his hippocampus, the area of the brain required in the transfer of memories from short-term to long-term storage. As a result, Wearing developed a profound case of total amnesia, both retrograde and anterograde. He is completely unable to form lasting new memories—his memory only lasts for between 7 and 30 seconds— and also cannot recall aspects of his past memories, frequently believing that he has only recently awoken from a coma. Anterograde amnesia is the inability to create new memories after the onset of amnesia, while memories from before the event remain intact. Brain regions related to this condition include the medial temporal lobe, medial diencephalon, and hippocampus. Anterograde amnesia can be caused by the effects of long-term alcoholism, severe malnutrition, stroke, head trauma, surgery, Wernicke-Korsakoff syndrome, cerebrovascular events, anoxia, or other trauma. Anterograde amnesia cannot be treated with pharmaceuticals because of the damage to brain tissue. However, sufferers can be treated through education to define their daily routines: typically, procedural memories (motor skills and routines like tying shoes or playing an instrument) suffer less than declarative memories (facts and events). Additionally, social and emotional support is important to improve the quality of life of those suffering from anterograde amnesia. Some types of forgetting are not due to traumatic brain injury, but instead are the result of the changes the human brain goes through over the course of a lifetime. Do you remember anything from when you were six months old? How about two years old? There’s a reason that nobody does. Childhood amnesia, also called infantile amnesia, is the inability of adults to retrieve memories before the age of 2–4. This is because for the first year or two of life, brain structures such as the limbic system (which holds the hippocampus and the amygdala and is vital t0 memory storage) are not yet fully developed. Research has shown that children have the capacity to remember events that happened to them from age 1 and before while they are still relatively young, but as they get older they tend to be unable to recall memories from their youngest years. Neurocognitive disorders are a broad category of brain diseases typical to old age that cause a long-term and often gradual decrease in the ability to think and recall memories, such that a person’s daily functioning is affected. “Neurocognitive disorder” is synonymous with “dementia” and “senility,” but these terms are no longer used in the DSM-5. For the diagnosis to be made there must be a change from a person’s usual mental functioning and a greater decline than one would expect due to aging. These diseases also have a significant effect on a person’s caregivers. The most common type of dementia is Alzheimer’s disease, which makes up 50% to 70% of cases. Its most common symptoms are short-term memory loss and word-finding difficulties. People with Alzheimer’s also have trouble with visual-spatial areas (for example, they may get lost often), reasoning, judgement, and insight into whether they are experiencing memory loss at all. Memories are not stored as exact replicas of reality; rather, they are modified and reconstructed during recall. Memories are fallible. They are reconstructions of reality filtered through people’s minds, not perfect snapshots of events. Because memories are reconstructed, they are susceptible to being manipulated with false information. Memory errors occur when memories are recalled incorrectly; a memory gap is the complete loss of a memory. In a 1932 study, Frederic Bartlett demonstrated how telling and retelling a story distorted information recall. He told participants a complicated Native American story and had them repeat it over a series of intervals. With each repetition, the stories were altered. Even when participants recalled accurate information, they filled in gaps with false information. Bartlett attributed this tendency to the use of schemas. A schema is a generalization formed in the mind based on experience. People tend to place past events into existing representations of the world to make memories more coherent. Instead of remembering precise details about commonplace occurrences, people use schemas to create frameworks for typical experiences, which shape their expectations and memories. The common use of schemas suggests that memories are not identical reproductions of experience, but a combination of actual events and already-existing schemas. Likewise, the brain has the tendency to fill in blanks and inconsistencies in a memory by making use of the imagination and similarities with other memories. Much research has shown that the phrasing of questions can also alter memories. A leading question is a question that suggests the answer or contains the information the examiner is looking for. For instance, one study showed that simply changing one word in a question could alter participants’ answers: After viewing video footage of a car accident, participants who were asked how “slow” the car was going gave lower speed estimations than those who were asked how “fast” it was going. Children are particularly suggestible to such leading questions. Intrusion errors occur when information that is related to the theme of a certain memory, but was not actually a part of the original episode, become associated with the event. This makes it difficult to distinguish which elements are in fact part of the original memory. Intrusion errors are frequently studied through word-list recall tests. Intrusion errors can be divided into two categories. The first are known as extra-list errors, which occur when incorrect and non-related items are recalled, and were not part of the word study list. These types of intrusion errors often follow what are known as the DRM Paradigm effects, in which the incorrectly recalled items are often thematically related to the study list one is attempting to recall from. Another pattern for extra-list intrusions would be an acoustic similarity pattern, which states that targets that have a similar sound to non-targets may be replaced with those non-targets in recall. The second type of intrusion errors are known as intra-list errors, which consist of irrelevant recall for items that were on the word study list. Although these two categories of intrusion errors are based on word-list studies in laboratories, the concepts can be extrapolated to real-life situations. Also, the same three factors that play a critical role in correct recall (i.e., recency, temporal association, and semantic relatedness) play a role in intrusions as well. A person’s motivations, intentions, mood, and biases can impact what they remember about an event. There are many identified types of bias that influence people’s memories. In this type of bias, the emotion associated with unpleasant memories “fades” (i.e., is recalled less easily or is even forgotten) more quickly than emotion associated with positive memories. Hindsight bias is the “I knew it all along!” effect. In this type of bias, remembered events will seem predictable, even if at the time of encoding they were a complete surprise. When you experience illusory correlation, you inaccurately assume a relationship between two events related purely by coincidence. This type of bias comes from the human tendency to see cause-and-effect relationships when there are none; remember, correlation does not imply causation. The mood congruence effect is the tendency of individuals to retrieve information more easily when it has the same emotional content as their current emotional state. For instance, being in a depressed mood increases the tendency to remember negative events. Another documented phenomenon is mood-state dependent retrieval, which is a type of context-dependent memory. The retrieval of information is more effective when the emotional state at the time of retrieval is similar to the emotional state at the time of encoding. Thus, the probability of remembering an event can be enhanced by evoking the emotional state experienced during its initial processing. This effect, also known as the Von Restorff effect, is when an item that sticks out more (i.e., is noticeably different from its surroundings) is more likely to be remembered than other items. In the self-reference effect, memories that are encoded with relation to the self are better recalled than similar memories encoded otherwise. When remembering an event, individuals will often perceive themselves as being responsible for desirable outcomes, but not responsible for undesirable ones. This is known as the self-serving bias. Source amnesia is the inability to remember where, when, or how previously learned information was acquired, while retaining the factual knowledge. Source amnesia is part of ordinary forgetting, but can also be a memory disorder. People suffering from source amnesia can also get confused about the exact content of what is remembered. Source confusion, in contrast, is not remembering the source of a memory correctly, such as personally witnessing an event versus actually only having been told about it. An example of this would be remembering the details of having been through an event, while in reality, you had seen the event depicted on television. Eyewitness testimony has been considered a credible source in the past, but its reliability has recently come into question. Research and evidence have shown that memories and individual perceptions are unreliable, often biased, and can be manipulated. Nobody plans to witness a crime; it is not a controlled situation. There are many types of biases and attentional limitations that make it difficult to encode memories during a stressful event. When witnessing an incident, information about the event is entered into memory. However, the accuracy of this initial information acquisition can be influenced by a number of factors. One factor is the duration of the event being witnessed. In an experiment conducted by Clifford and Richards (1977), participants were instructed to approach police officers and engage in conversation for either 15 or 30 seconds. The experimenter then asked the police officer to recall details of the person to whom they had been speaking (e.g., height, hair color, facial hair, etc.). The results of the study showed that police had significantly more accurate recall of the 30-second conversation group than they did of the 15-second group. This suggests that recall is better for longer events. The other-race effect (a.k.a., the own-race bias, cross-race effect, other-ethnicity effect, same-race advantage) is one factor thought to affect the accuracy of facial recognition. Studies investigating this effect have shown that a person is better able to recognize faces that match their own race but are less reliable at identifying other races, thus inhibiting encoding. Perception may affect the immediate encoding of these unreliable notions due to prejudices, which can influence the speed of processing and classification of racially ambiguous targets. The ambiguity in eyewitness memory of facial recognition can be attributed to the divergent strategies that are used when under the influence of racial bias. The weapon-focus effect suggests that the presence of a weapon narrows a person’s attention, thus affecting eyewitness memory. A person focuses on a central detail (e.g., a knife) and loses focus on the peripheral details (e.g. the perpetrator’s characteristics). While the weapon is remembered clearly, the memories of the other details of the scene suffer. This effect occurs because remembering additional items would require visual attention, which is occupied by the weapon. Therefore, these additional stimuli are frequently not processed. Trials may take many weeks and require an eyewitness to recall and describe an event many times. These conditions are not ideal for perfect recall; memories can be affected by a number of variables. 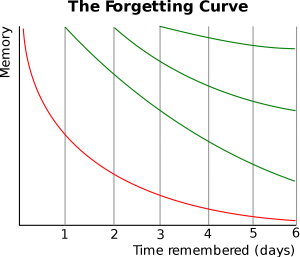 The forgetting curve of memory: The red line shows that eyewitness memory declines rapidly following initial encoding and flattens out after around 2 days at a dramatically reduced level of accuracy. The accuracy of eyewitness memory degrades swiftly after initial encoding. 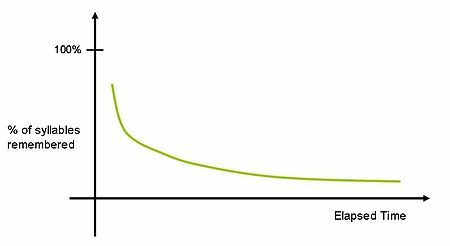 The “forgetting curve” of eyewitness memory shows that memory begins to drop off sharply within 20 minutes following initial encoding, and begins to level off around the second day at a dramatically reduced level of accuracy. Unsurprisingly, research has consistently found that the longer the gap between witnessing and recalling the incident, the less accurately that memory will be recalled. There have been numerous experiments that support this claim. Malpass and Devine (1981) compared the accuracy of witness identifications after 3 days (short retention period) and 5 months (long retention period). The study found no false identifications after the 3-day period, but after 5 months, 35% of identifications were false. In a legal context, the retrieval of information is usually elicited through different types of questioning. A great deal of research has investigated the impact of types of questioning on eyewitness memory, and studies have consistently shown that even very subtle changes in the wording of a question can have an influence. One classic study was conducted in 1974 by Elizabeth Loftus, a notable researcher on the accuracy of memory. In this experiment, participants watched a film of a car accident and were asked to estimate the speed the cars were going when they “contacted” or “smashed” each other. Results showed that just changing this one word influenced the speeds participants estimated: The group that was asked the speed when the cars “contacted” each other gave an average estimate of 31.8 miles per hour, whereas the average speed in the “smashed” condition was 40.8 miles per hour. Age has been shown to impact the accuracy of memory as well. Younger witnesses, especially children, are more susceptible to leading questions and misinformation. There are also a number of biases that can alter the accuracy of memory. For instance, racial and gender biases may play into what and how people remember. Likewise, factors that interfere with a witness’s ability to get a clear view of the event—like time of day, weather, and poor eyesight—can all lead to false recollections. Finally, the emotional tone of the event can have an impact: for instance, if the event was traumatic, exciting, or just physiologically activating, it will increase adrenaline and other neurochemicals that can damage the accuracy of memory recall. “Memory conformity,” also known as social contagion of memory, refers to a situation in which one person’s report of a memory influences another person’s report of that same experience. This interference often occurs when individuals discuss what they saw or experienced, and can result in the memories of those involved being influenced by the report of another person. Some factors that contribute to memory conformity are age (the elderly and children are more likely to have memory distortions due to memory conformity) and confidence (individuals are more likely to conform their memories to others if they are not certain about what they remember). The issue of whether memories can be repressed is controversial, to say the least. Some research indicates that memories of traumatic events, most commonly childhood sexual abuse, may be forgotten and later spontaneously recovered. However, whether these memories are actively repressed or forgotten due to natural processes is unclear. In one study where victims of documented child abuse were re-interviewed many years later as adults, a high proportion of the women denied any memory of the abuse. Some speculate that survivors of childhood sexual abuse may repress the memories to cope with the traumatic experience. In cases where the perpetrator of the abuse is the child’s caretaker, the child may push the memories out of awareness so that he or she can maintain an attachment to the person on whom they are dependent for survival. Traumatic memories are encoded differently than memories of ordinary experiences. In traumatic memories, there is a narrowed attentional focus on certain aspects of the memory, usually those that involved the most heightened emotional arousal. For instance, when remembering a traumatic event, individuals are most likely to remember how scared they felt, the image of having a gun held to their head, or other details that are highly emotionally charged. The limbic system is the part of the brain that is in charge of giving emotional significance to sensory inputs; however, the limbic system (particularly one of its components, the hippocampus ) is also important to the storage and retrieval of long-term memories. Supporters of the existence of repressed memories hypothesize that because the hippocampus is sensitive to stress hormones and because the limbic system is heavily occupied with the emotions of the event, the memory-encoding functionality may be limited during traumatic events. The end result is that the memory is encoded as an affective (i.e., relating to or influenced by the emotions) and sensory imprint, rather than a memory that includes a full account of what happened. In this way, traumatic experiences appear to be qualitatively different from those of non-traumatic events, and, as a result, they are more difficult to remember accurately. Psychological disorders exist that could cause the repression of memories. Psychogenic amnesia, or dissociative amnesia, is a memory disorder characterized by sudden autobiographical memory loss, said to occur for a period of time ranging from hours to years. More recently, dissociative amnesia has been defined as a dissociative disorder characterized by gaps in memory of personal information, especially of traumatic events. These gaps involve an inability to recall personal information, usually of a traumatic or stressful nature. In a change from the DSM-IV to the DSM-5, dissociative fugue is now classified as a type of dissociative amnesia. Psychogenic amnesia is distinguished from organic amnesia in that it is supposed to result from a nonorganic cause; no structural brain damage or brain lesion should be evident, but some form of psychological stress should precipitate the amnesia. However, psychogenic amnesia as a memory disorder is controversial. Memories of events are always a mix of factual traces of sensory information overlaid with emotions, mingled with interpretation and filled in with imaginings. Thus, there is always skepticism about the factual validity of memories. There is considerable evidence that, rather than being pushed out of consciousness, traumatic memories are, for many people, intrusive and unforgettable. Given research showing how unreliable memory is, it is possible that any attempt to “recover” a repressed memory runs the risk of implanting false memories. 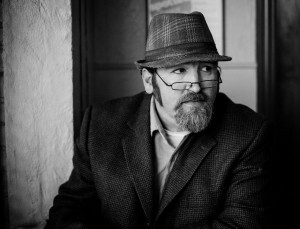 Researchers who are skeptical of the idea of recovered memories note how susceptible memory is to various manipulations that can be used to implant false memories (sometimes called “pseudomemories”). 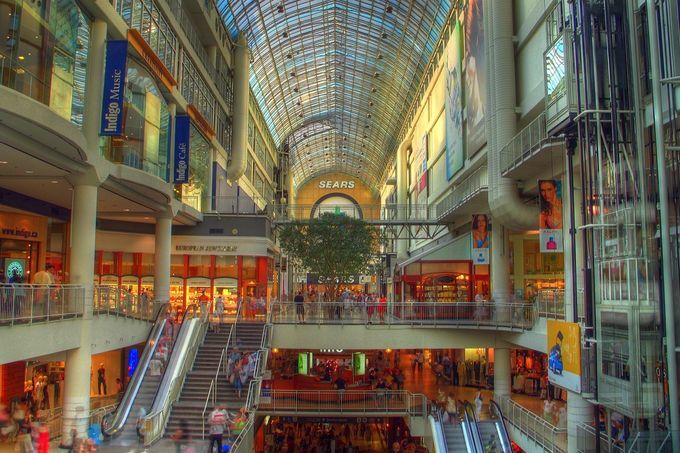 A classic study in memory research conducted by Elizabeth Loftus became widely known as the “lost in the mall” experiment. In this study, subjects were given a booklet containing three accounts of real childhood events written by family members and a fourth account of a fictitious event of being lost in a shopping mall. A quarter of the subjects reported remembering the fictitious event, and elaborated on it with extensive circumstantial details. 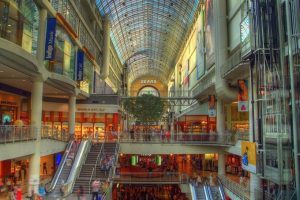 “Lost in the mall” experiment: Some of the early research in memory conformity involved the “lost in the mall” technique. This entry was posted in Cognition, Cognitive Science, Memory, Neuroscience, Psychology. Bookmark the permalink.